« I’m in a Hurry . . . to Slow Down! 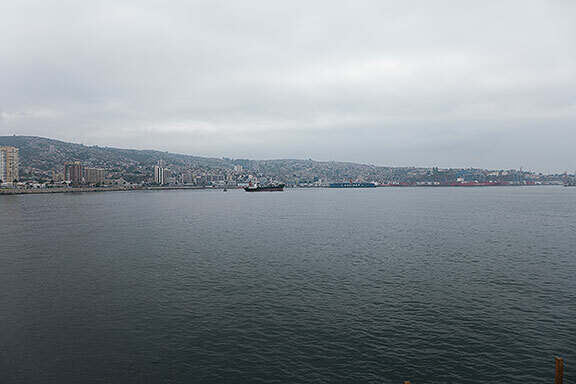 Valparaiso, Chile, view south from fishing pier in bay. 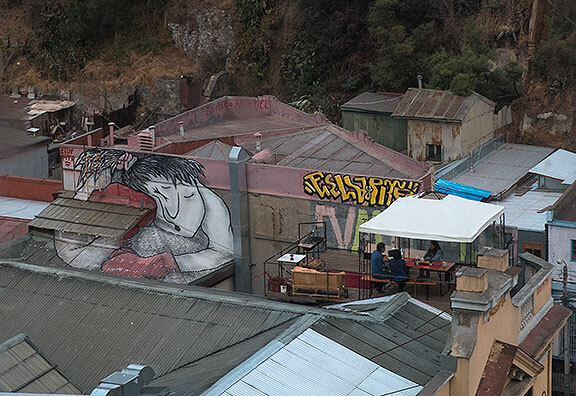 Valparaiso, Chile is a spectacularly beautiful city. It seems appropriate that it is a sister-city to San Francisco as it shares the Pacific Ocean and a very hilly topography, along with the historic connection that linked Chile to San Francisco’s Gold Rush in 1849-1850. 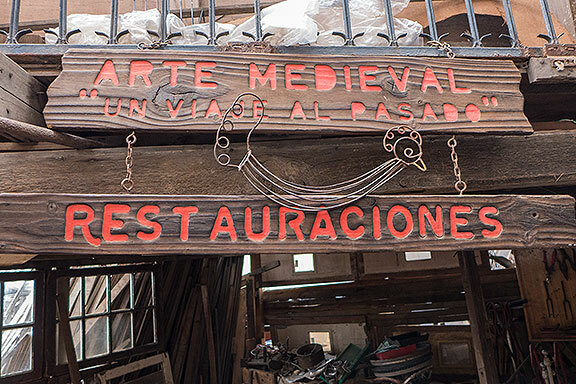 Chileans were one of the largest populations to arrive in the early days of the Gold Rush, since they were closer, though their presence was quickly overwhelmed by tens of thousands of people from France, Germany, England, the U.S., and elsewhere. 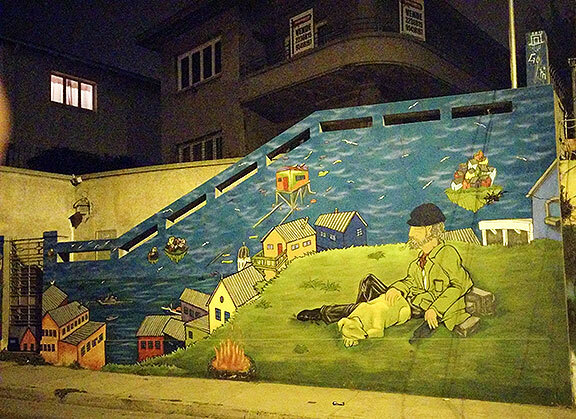 There’s no memory of that Chilean connection in San Francisco these days, though as I mentioned in the previous post, a more recent wave of Chileans arrived in San Francisco during the 1970s as refugees from the Pinochet dictatorship. 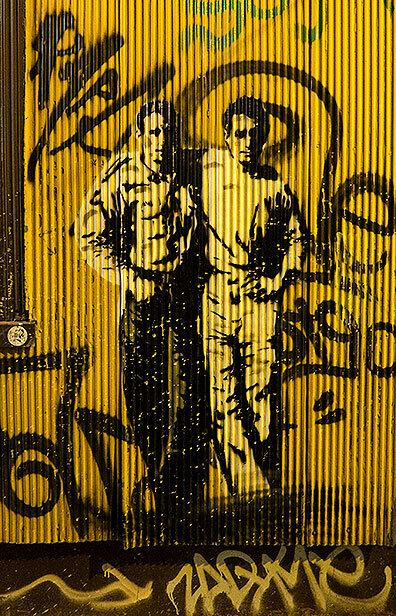 This stencil of Jack Kerouac and Neil Cassady is an iconic image used for years by City Lights Books in San Francisco… and here it was on the walls of Valparaiso, keeping alive the connection between the two cities? If we historicize that a bit more precisely, those Chileans were the first escapees from the harsh imposition of a neoliberalism determined to smash the organized working class. After the 1973 Chilean coup, new military dictatorships from Argentina to Indonesia, South Korea and the Philippines were backed by the U.S. as bulwarks of the “Free World;” at gunpoint they freed markets for international investors by breaking unions and selling off publicly owned assets. Milton Friedman’s “Chicago Boys” provided their throwback economic theories to Margaret Thatcher and Ronald Reagan and their market fundamentalism drove the reorganization of the global order that landed us in the mess we’re in now. 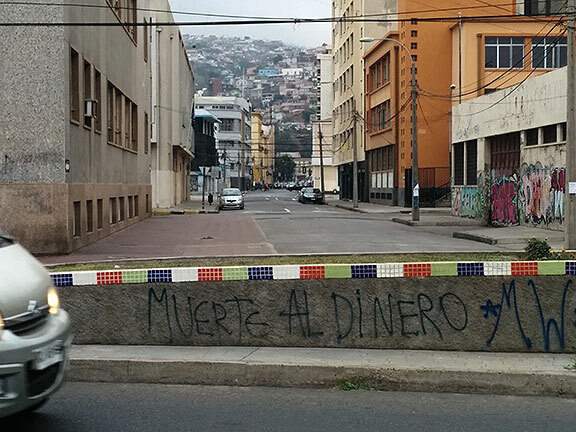 “Death to money” graffiti on coastal boulevard in Valparaiso. The 1879-83 War of the Pacific with Bolivia and Peru that seized territory rich in saltpeter and copper, and left Bolivia landlocked without the sea coast they had when the war started. A brief civil war in the 1891 between the President, backed by the Army, and the Congress, backed by the Navy, won by the latter. The curious coincidence between Chilean national politics and California when in 1938 both saw the election of left-leaning Popular Front governments. 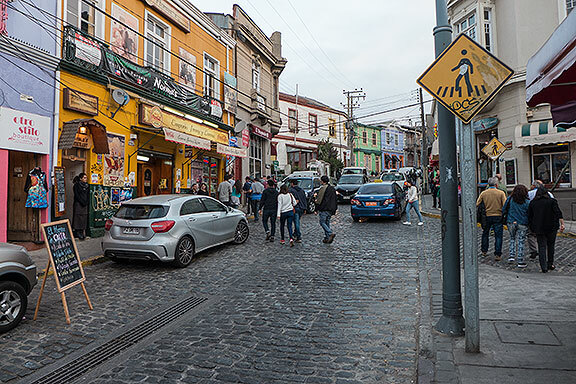 Valparaiso, or Valpo as it is sometimes called, had long been a city that I imagined, and the real place did not disappoint, even if my uninformed fantasies proved to be entirely inaccurate. 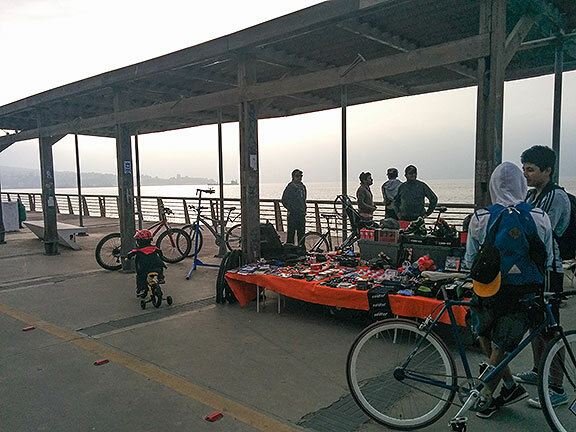 A bustling container port, an elegant dying old financial district, funiculars climbing from commercial lowlands to residential hillside neighborhoods, a seaside bikeway connecting Valpo to nearby wealthy enclave Vina del Mar. 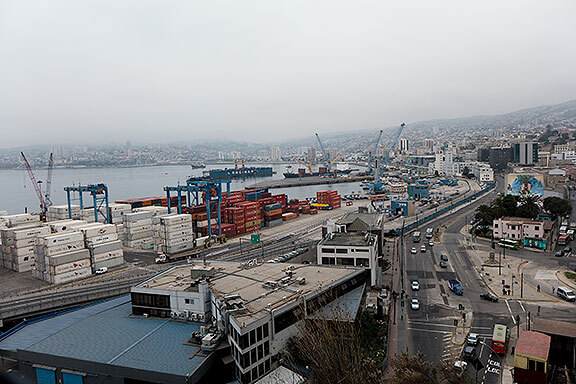 Valpo has a thriving container port. 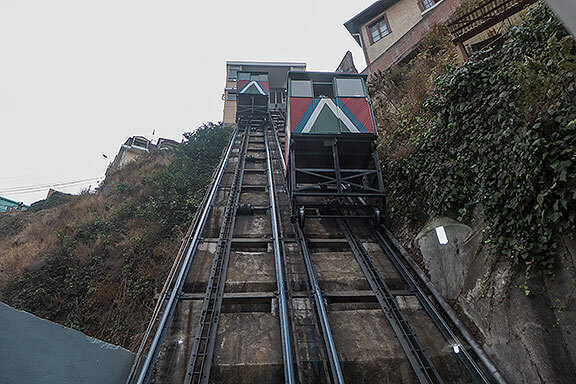 One of many ascensores, or funiculars, traversing the steep slopes. 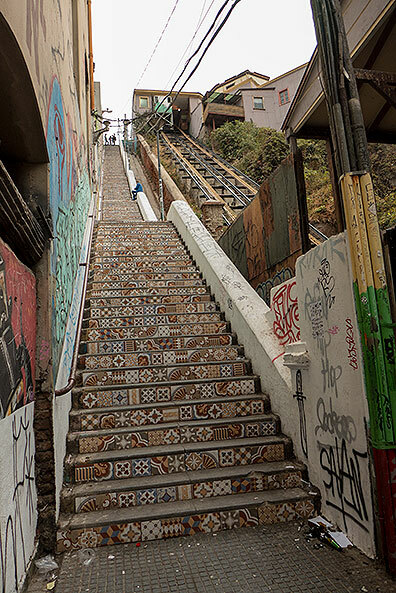 Mosaic-decorated stairs next to another funicular. 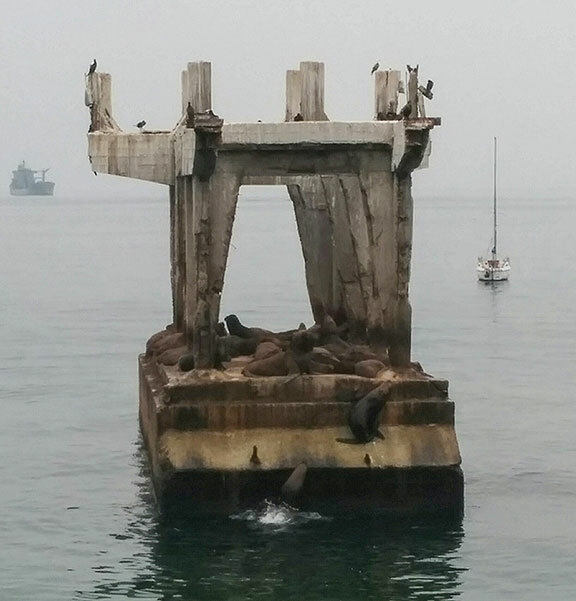 A once-bustling financial district, now rather hollowed out. 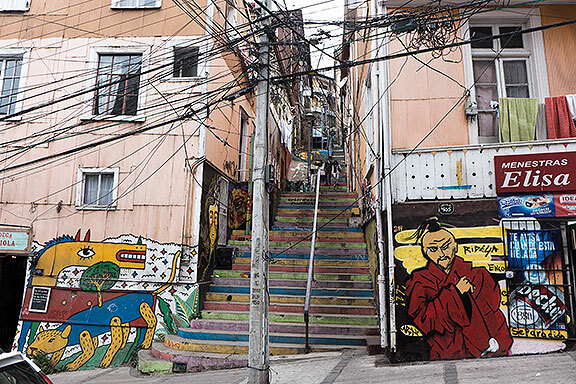 Some of the hilltop neighborhoods just above the downtown area are rapidly gentrifying while adjacent areas are left mired in the poverty that neoliberal prosperity necessarily produced. 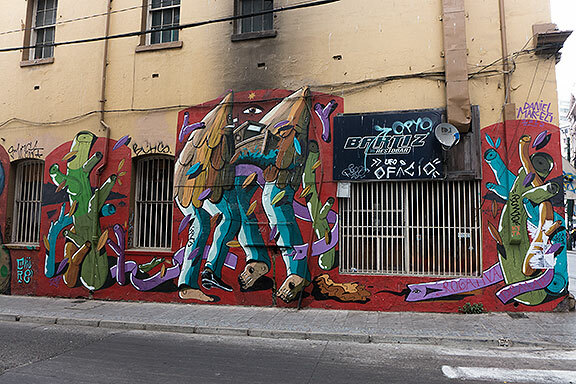 Wherever I went walking around Valparaiso’s streets I found street art from graffiti to spraycan murals to sophisticated large works by very talented artists. View north from hill above downtown. 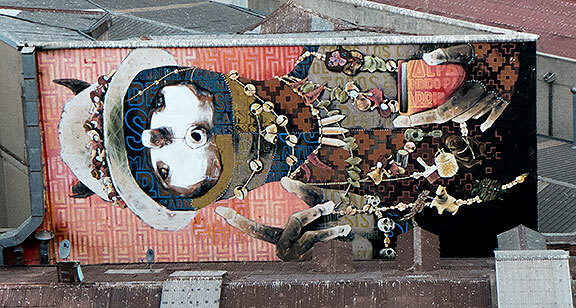 Gorgeous mural below! Ricardo Jerez, my wonderful host and guide, knows Valparaiso very well since he’d lived there for years before returning to Santiago. We hardly stopped moving for the weekend we spent in the city and he took me to so many wonderful spots. 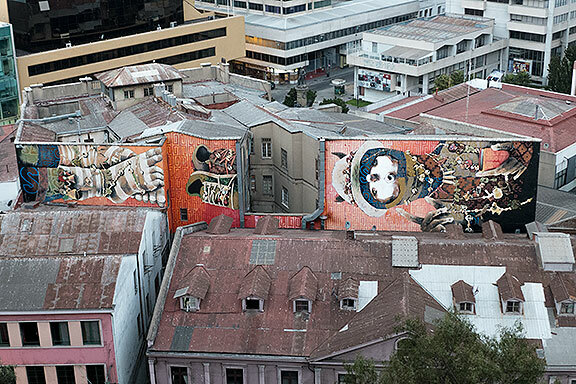 I was constantly delighted by the street art and we even came upon a steep block that had gone through a bit of a Nowtopian transformation with trees planted in the middle and gorgeous murals gracing the houses. 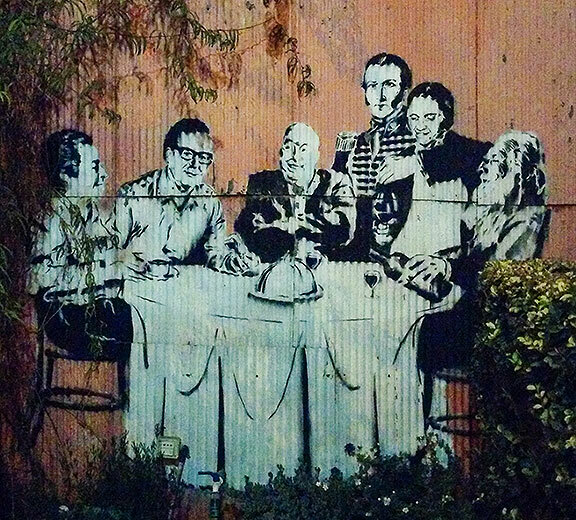 This stencil is at the top of the block with the trees in the street, featuring giants of Chilean culture: (l to r) Gabriela Mistral, Salvador Allende, Pablo Neruda, Manuel Rodriguez, Violeta Parra, and Clotario Blest. 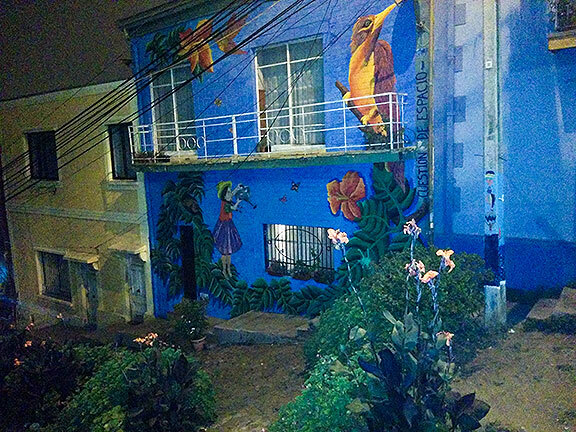 This mural was on the hill-traversing Cintura road, which we came upon on a late night wander. A random corner in the downtown area. 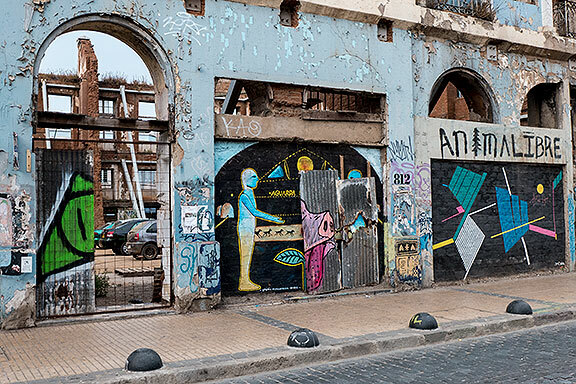 A lot of abandoned and crumbling buildings become canvases, sort of like the good old days in San Francisco! After I went up one of the funiculars I took this shot looking back at a roof garden below. 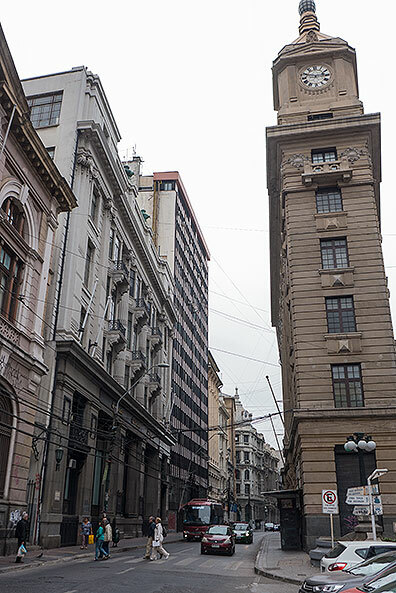 It was a surprise to exit my first ascensore on Cerro de Alegria and immediately find myself amidst walkways, cafes, art galleries, street musicians, etc. 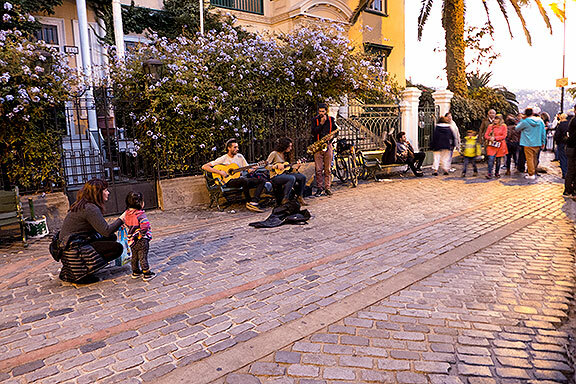 It was unmistakably a gentrifying neighborhood but at that stage that still harbors struggling artists, street musicians, and déclassé bohemians, a stage that precedes the wholesale class- and racial cleansing underway here in San Francisco. Tourist friendly promenade overlooking the port. 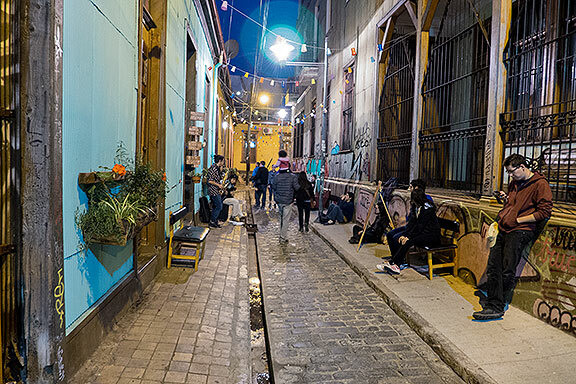 Cozy alleys with art galleries and buskers… such a familiar scene! Same stairway from bottom earlier in the day. Thriving street scene on gentrifying hilltop. No wonder this hilltop has seen a huge influx of money…. great architecture! narrow streets! pedestrian friendly! 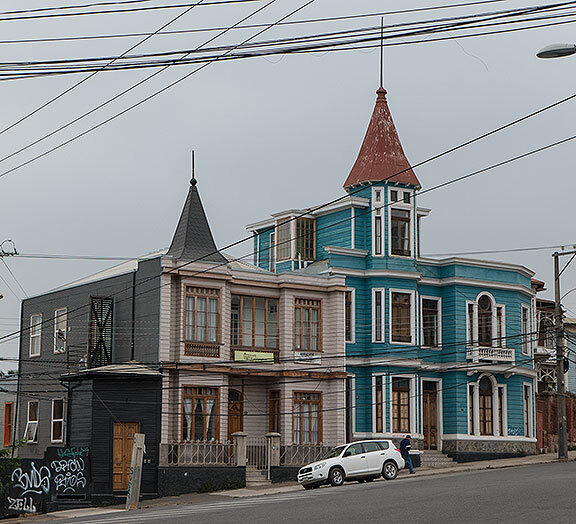 Ricardo took me to Playa Ancha, another neighborhood with mid-19th century Victorians originally settled by the many British who came to Chile, but hasn’t yet gone into the spiralling madness of property fever. Playa Ancha victorians, c. 1850s. Similar but very different than the styles in San Francisco. 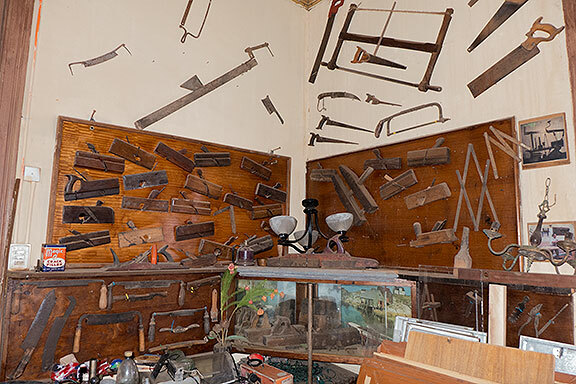 Our visit to Playa Ancha was focused on visiting the “House of Gus” as Ricardo described it to me. 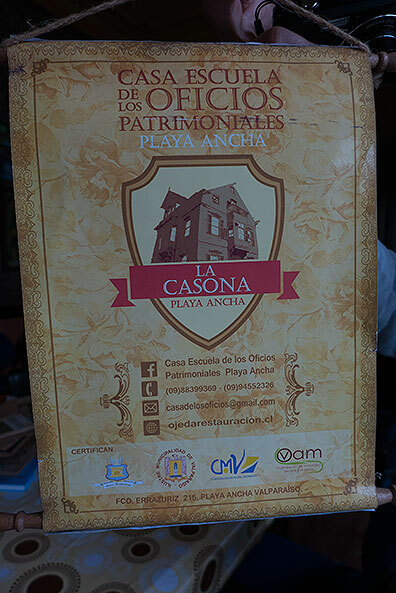 La Casona, the House of Gus! 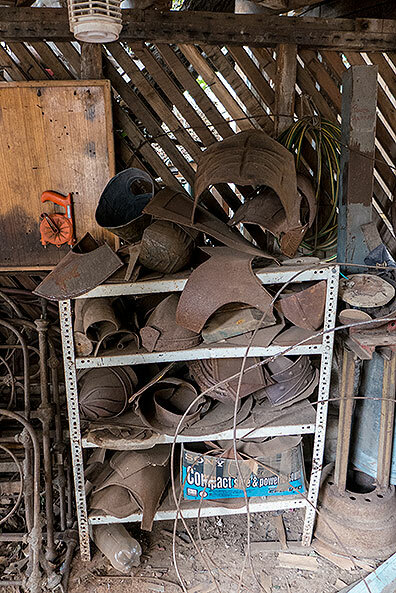 … Until I came upon this container of rusting armor… how old?!? 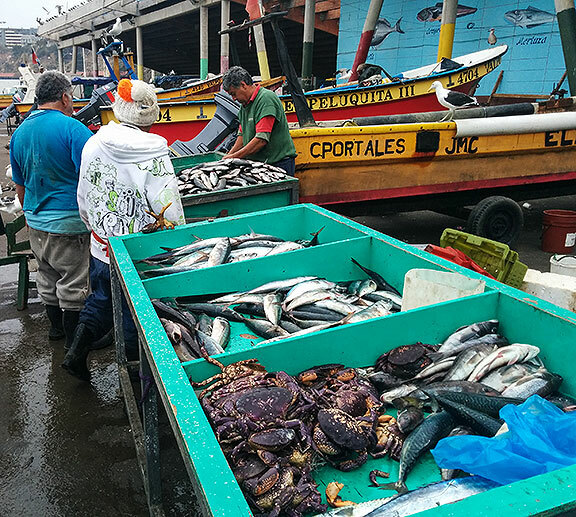 We also took a long bike ride along the coast to Viña del Mar, which gave us a chance to visit an old-style fish market. 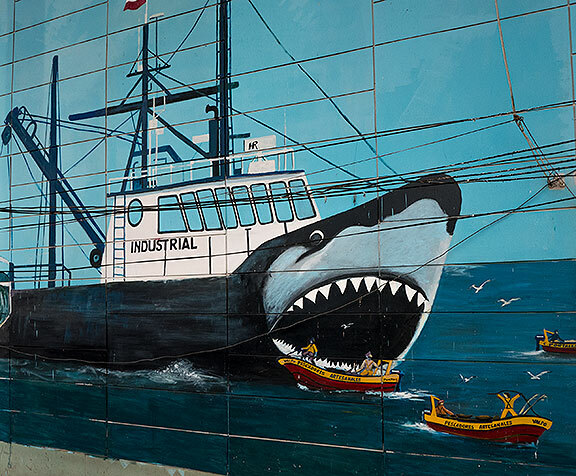 A protest mural at the fish market on behalf of artisanal fishing vs. industrial trawling. 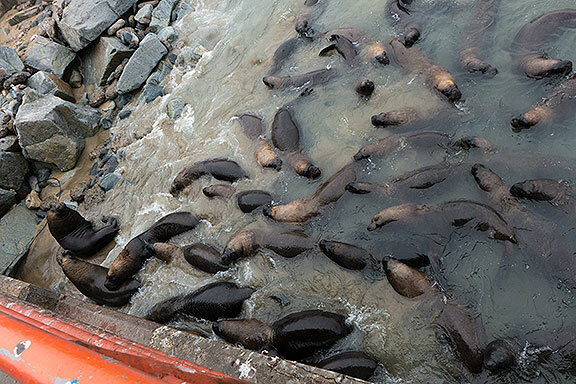 Sea lions crowd the beach under the fishing pier at the fish market. 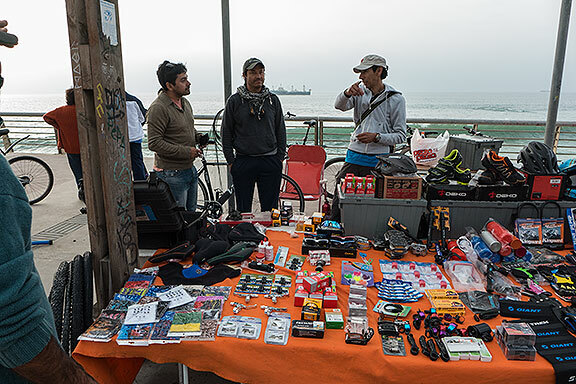 Along the dedicated bikeway along the sea, Juan runs a regular but unofficial bike shop. Ricardo explaining local geography to a passing cyclist. 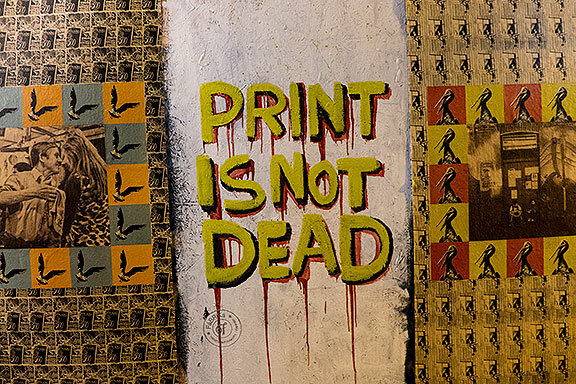 Lastly, here’s a spooky inadvertent reminder of the tens of thousands who disappeared during the dictatorship. 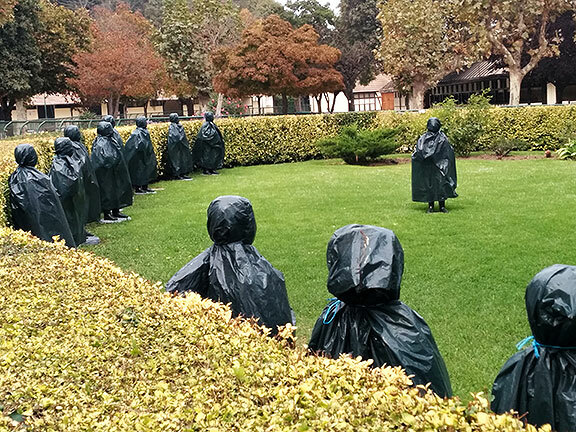 At the racetrack in Vina del Mar… jockey statues under there? 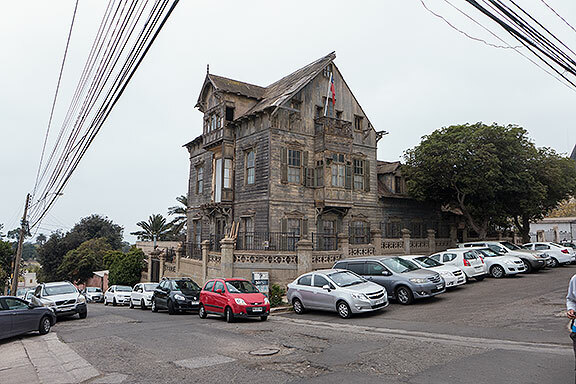 In just over a kilometer, Britain Avenue, which runs along the edge of the plain of Playa Ancha seeking views towards the sea, brings together a remarkable set of wooden houses built in the late nineteenth and early twentieth centuries, both by foreign architects as Chileans. 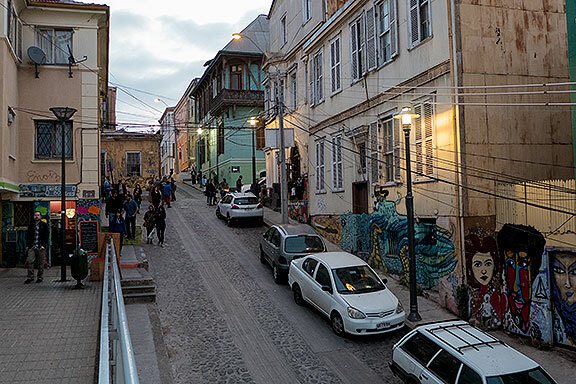 This route is the first leg of the Camino Waist transversely connects all the hills of Valparaiso, at an altitude hundred meters above sea level. 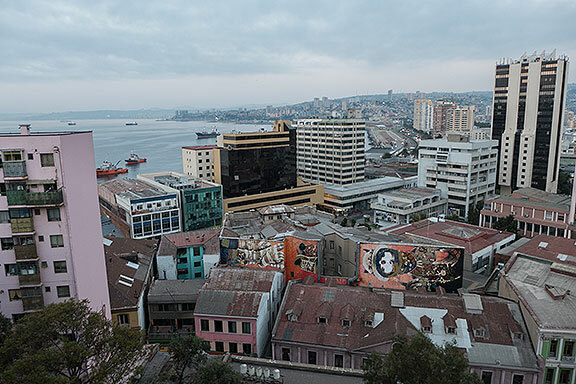 Considered a historic landmark, the 1906 earthquake not only destroyed much of the populated areas of Valparaiso as the area of ​​El Almendral and the hills saturated Alegre and Concepción, but also established in momentum for the development of other areas of the ancient valley the Quintile name which they gave the monkeys to the city- such as plain Playa Ancha. 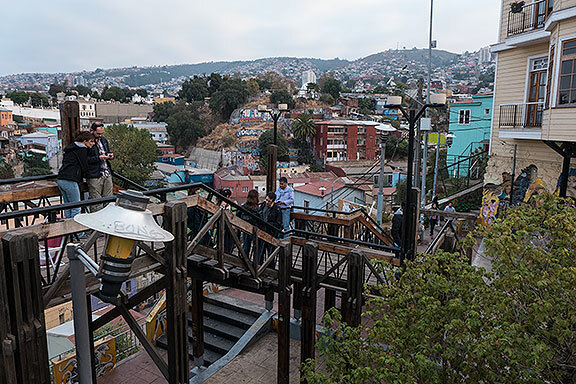 This area located in the western part of the bay, which stretches from the coastline and covers part of the current hills Artillery and Playa Ancha, began to be populated more intensely especially old Chilean families with high purchasing power, most landowners who took this place as first choice and generous rose isolated houses surrounded by gardens. 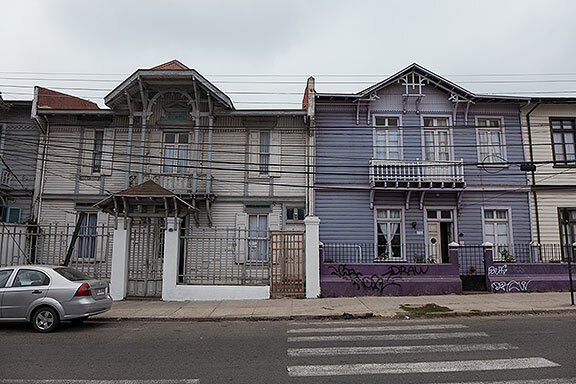 Phenomenon that manifested itself differently in the already famous hills Alegre and Concepcion, where British, Germans, Americans ended up staying in Chile, built mostly continuous semi-detached houses or in some cases only had minimal expressions garden. 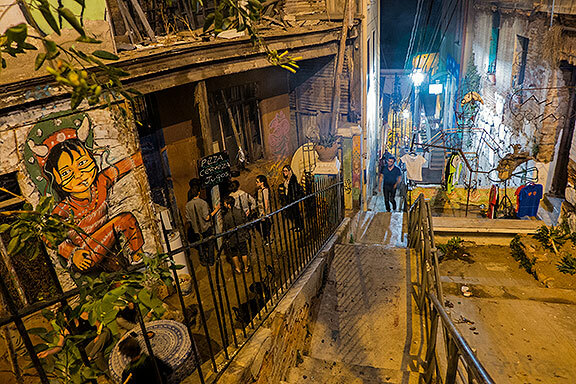 Valparaiso always surprising with the colorfull, stairs and special city life. 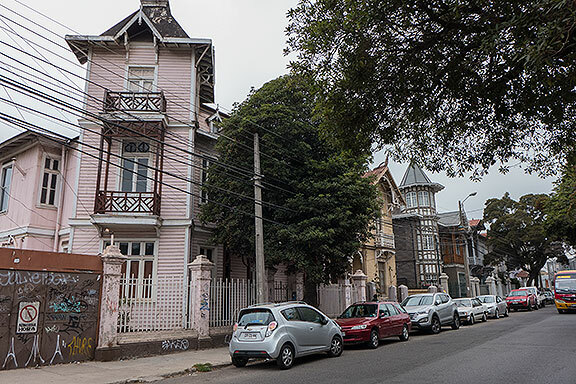 Only one correction: these houses in this area of Playa Ancha, were built after the earthquake in 1906, a lot of houses was designed by the arquitect Esteban Harrington, with a special connection with San Francisco. Thanks Chris! I love your “underground” travelogs.